THERE AREN’T MANY COLLEGE STUDENTS who can say they’ll graduate virtually debt-free and with multiple job offers. That is, unless you talk with many of the bright, hardworking students graduating from Maine’s Community Colleges. Each year, from nursing to culinary arts, automotive to HVAC, electrical to public safety education and more, Maine’s Community Colleges prepare thousands of students to enter the workforce directly or to develop the academic foundation for continuing their education at a four-year school. Thanks to the newly revamped Sustainable Construction program at Kennebec Valley Community College (KVCC), you can add skilled building construction professionals to the list. Buoyed by the growing public interest in higher performing buildings that produce healthy, comfortable environments for their inhabitants, plus a hot housing market in Maine and across the country, the demand for skilled tradesmen and women is strong. 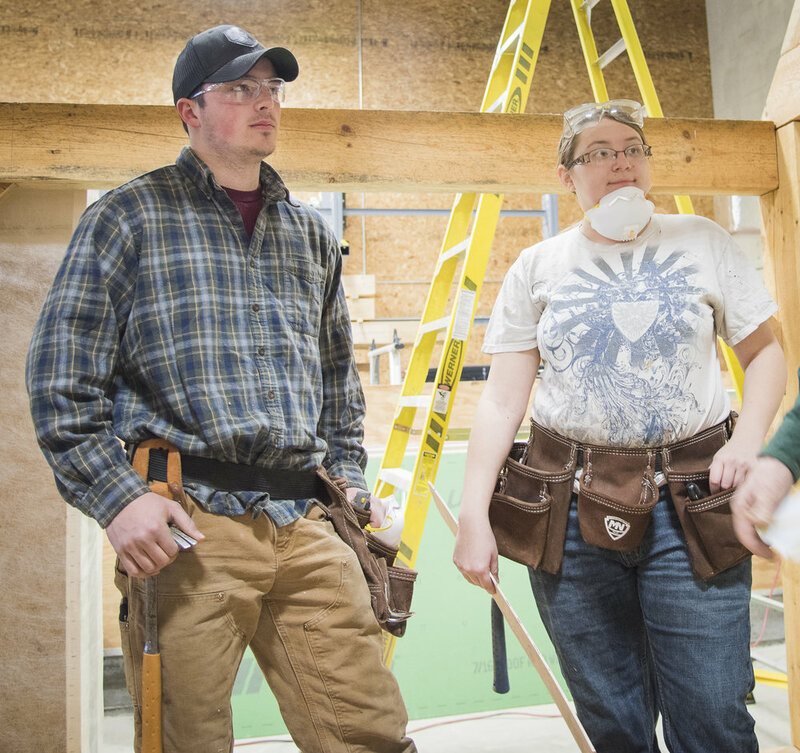 Funded by a U.S. Department of Labor grant program, the KVCC curriculum challenges students to consider ways of improving how new homes in Maine (and throughout New England) are built, and how to improve energy efficiency in both new and existing homes. While educating students about the importance of energy efficiency is a defining characteristic of the program, achieving the highest possible levels of building performance is only one measure of success. For example, students also gain a better understanding of the value of sourcing building materials locally, occupant health and safety considerations when designing a tight, energy efficient building envelope and the implications of installing a renewable energy system at home. "Pretty Good" is just fine. The KVCC curriculum was inspired by the Pretty Good House methodology (see Spring, 2017 edition of this magazine), a now nationally-recognized, albeit informal, approach to building systems established in 2009 by a group of forward-thinking Maine building professionals. While not officially endorsed, the courses follow the same principles and guidelines of the “Pretty Good House,” a low impact home that also strikes a reasonable balance between short-term (construction, material, appliance) costs and long-term (energy use, occupant comfort, durability) costs. In fact, finding balance is a theme that can be found throughout many of the courses in the program. Michael Maines, an experienced home builder specializing in residential design and build, restoration and energy efficient retrofit work, believes these are important concepts for students to learn. “The ‘house as a system’ approach to residential construction requires builders to consider the relationship between every design/material choice and its potential impact on the overall performance of the home,” says Maines. The 2-year (60 credit hour) associate degree program leads students through the entire design/build process, covering conventional construction methods, advanced building system technology and the time-honored craftmanship of timber frame joinery. Along with hands-on training with power tools, wood framing, insulation and restoration work, students also spend time in the classroom learning project management skills, architectural history and how to operate a small business. Technology-intensive courses, including engineering, drafting, CAD and 3D modeling, are also required. This fall, KVCC will launch two 1-year certificate programs, Framing & Craftsmanship and Carpentry & Building Science, which allow students to focus in on various aspects of the program. The mix of hands-on shop class instruction and classroom learning was purposely created to help ensure that students are introduced to a variety of ways they can pursue a career in the construction industry—ideally right here in Maine. Partnering with local business leaders, community members and construction industry professionals to form a Program Advisory Committee, the KVCC faculty left little to chance in putting its curriculum together. With early and ongoing input from nearly 20 committee members, the program focuses entirely on what employers say they need—organized, reliable team members who are comfortable with technology and who know how to execute the fundamental activities of the trade. That’s the plan for Brelyn LaFreniere, a first-year student at KVCC. Brelyn was first attracted to the Sustainable Construction program’s computer-based drafting, design and architecture courses. However, she says the hands-on training, like learning how to cut a mortise and tenon joint with a wooden mallet and chisel, has been worthwhile, too. Since many of the course credits she is earning at KVCC are transferable, following graduation next year, LaFreniere plans to pursue an engineering-related degree at the University of Maine in Augusta, ideally while working as a design consultant for a construction company or building supply store. Scott Lamer believes the program is a logical next step for students who are graduating from vocational schools and want to learn more about a certain trade. Lamer is also working to connect with kids from non-voc high schools to let them know what the KVCC program is all about. “We want to reach out to kids who may feel like their only choices are to go to a 4-year school and rack up a ton of debt or go to work,” he says. Lamer estimates that over the last 12 months, he’s personally met with guidance counselors, instructors and students at more than 30 Maine schools. Wayne, Maine. In the house. Vincent Birtwell is a second-year student in the Sustainable Construction program. He grew up in Wayne, Maine in an old farmhouse that also had a large, 200-year-old timber framed barn nearby. He grew up fascinated with how the huge building had been put together, piece by piece—without nails, screws or metal braces. As a high school student in Augusta, Vincent spent a lot of time in the wood shop of his vocational school. During his senior year, his instructor, Bruce Baker (now retired) recognized his developing skills and obvious interest in woodworking and recommended that he consider the Sustainable Building program at KVCC. Vincent says he’s already been in touch with several builders in the area who would like to add him to their team after he graduates. Right now, he’s most interested in pursuing work that involves timber framing and has ambitions to start his own business someday. “There’s nothing wrong with doing ‘stick built’ construction, and I’ve learned a lot more about that here at KVCC,” Birtwell continues. Nothing beats the long-term value of high quality work. Like almost everything else in the world, no one can argue with the fact that the building and construction industry has been forever changed by technology. Today, new homes are not only designed almost entirely on a computer, energy modeling software can now accurately predict exactly how much energy the not-yet-built-home will end up using. Yet all the latest technology won’t prevent a window from leaking if it’s not installed correctly. At the end of the day, what still matters the most is the skill level of the person standing there with the hammer, saw and caulking gun in their hand. The faculty, advisors and instructors involved with the Sustainable Construction program at KVCC have created a broad, balanced curriculum that will serve students well in the future. Today’s modern home builders and contractors must not only stay up-to-date on new products, materials and technology, they also need to have a firm grasp on the fundamental rules and methods that are time-tested and proven to work. The students at KVCC are being prepared to graduate knowing how to construct homes to the best of their abilities today, while also being introduced to the idea—and the technological tools—that suggest the construction industry’s best is yet to come. Tech and tools aside, the most promising element of the burgeoning Sustainable Construction program is the enthusiasm and optimism it has sparked in these students. All told, KVCC is furnishing a better future for students, homes and the Maine work force. That’s a pretty good program indeed. This article is reprinted from the spring 2018 issue of Green & Healthy Maine Homes. Subscribe today!